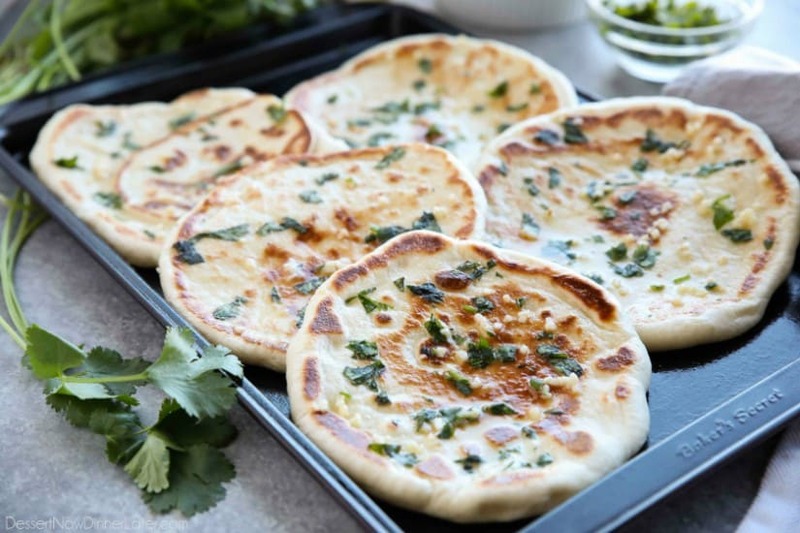 Easy Garlic Naan - Dessert Now, Dinner Later! 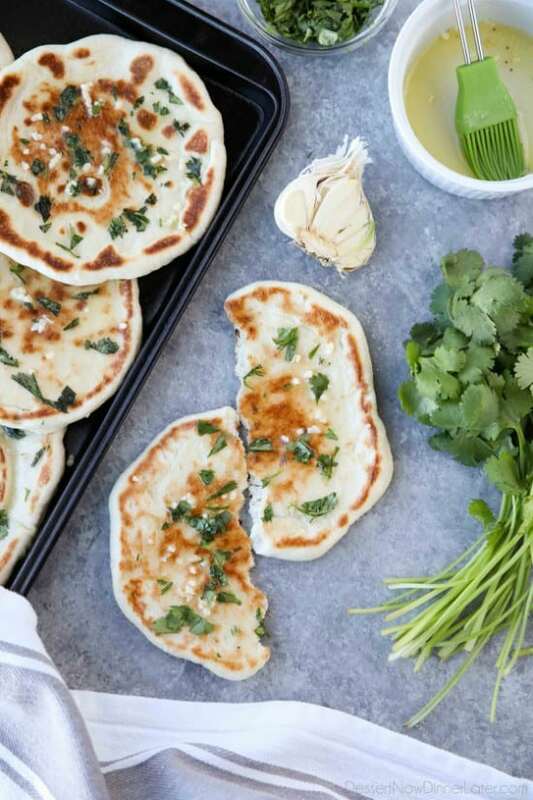 This buttery Garlic Naan flatbread is made easy with store-bought frozen dough. 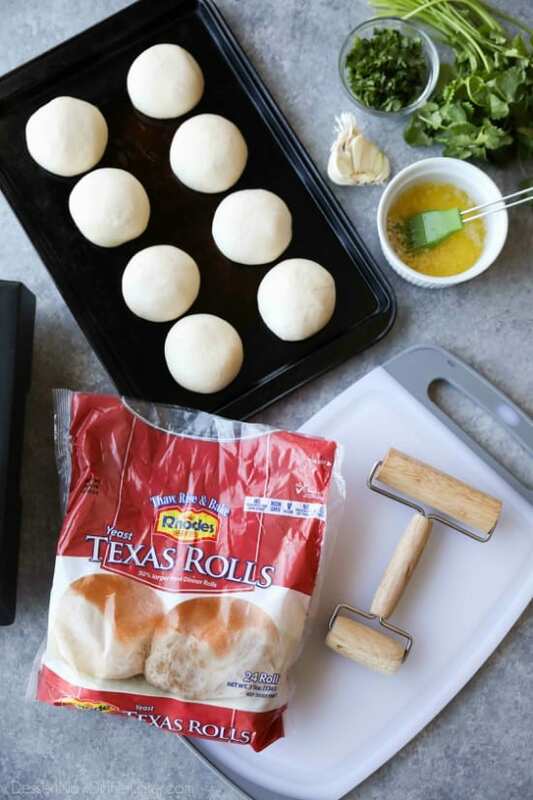 Enjoy restaurant-style Indian bread with dinner anytime, it’s so easy! 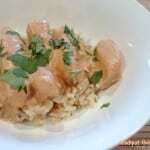 Around 11 years ago I was a Culinary Arts Student taking a World Cuisines class. One of our assignments was to go to an ethnic restaurant and try some new foods. My family didn’t eat out much growing up, so I don’t think I had tried anything out of the ordinary. My mom is from Wyoming and my dad is from Louisiana, so the closest thing to cultural food that I had tried was some dirty rice and beans that my dad made like once. Which is also still just American food. The closest thing to ethnic food that I had experienced was tacos, but not the delicious street tacos I can find at a food truck nowadays. Just boring old ground beef tacos with a store-bought taco packet with some water added in. I was excited for this fun assignment to try some new, ethnic, foods. My boyfriend (now husband) and I decided to go to this little Indian restaurant in town that was really popular. It was actually located inside a gas station, but they had some award-winning food. I believe we had some vegetable samosas, chicken tikka masala, and garlic naan. I loved every bit of it! 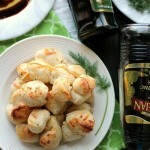 The garlic naan was especially addicting, so I thought of a super easy way to make it at home. Then I brushed some sautéed garlic-butter over the hot bread, and finished it with a little bit of chopped cilantro. Perfection! 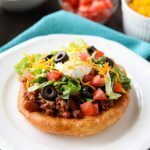 My kids are picky, but occasionally they are interested in trying some of our favorite ethnic foods. 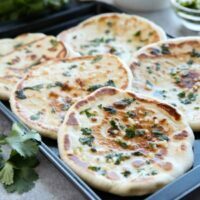 They gave this garlic naan recipe two thumbs up! It smells wonderful and tastes delicious! They even ate the cilantro. Melt butter in a pan over the stovetop, add garlic and sauté for 30 seconds to 1 minute or until fragrant, but not burnt. 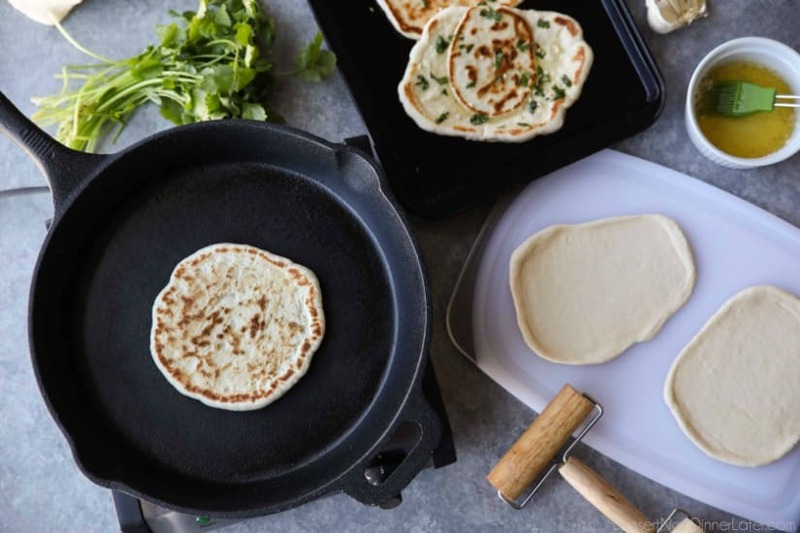 Heat a skillet or griddle to medium-high heat. Cook dough for about 1 minute on one side until the dough starts to bubble and brown on the bottom. Flip the dough and cook 30-60 seconds more, until golden brown. 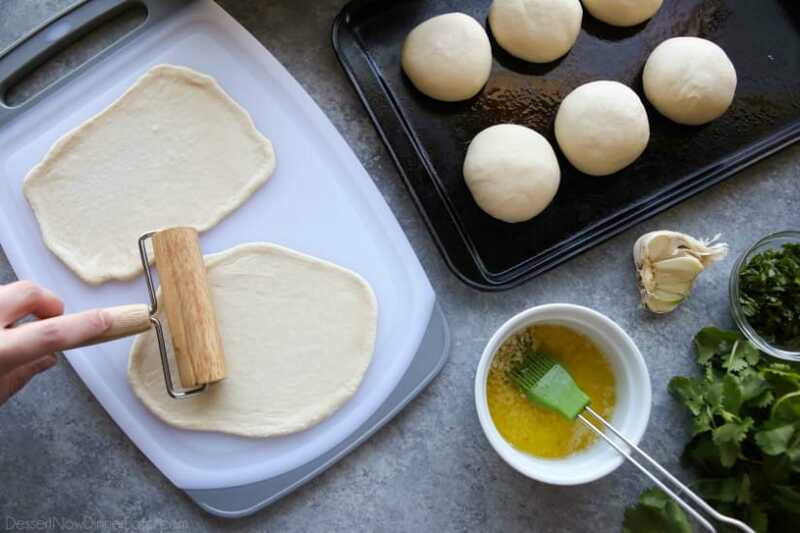 Press dough down with a spatula if it's bubbling up too much. 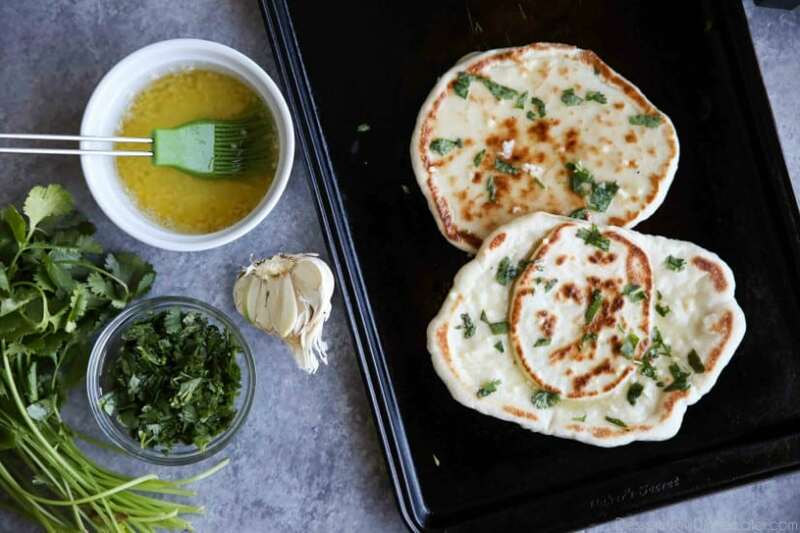 Immediately brush with the melted garlic-butter and sprinkle with chopped cilantro. Enjoy warm! 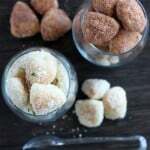 Store leftovers in an airtight zip-top bag at room temperature. 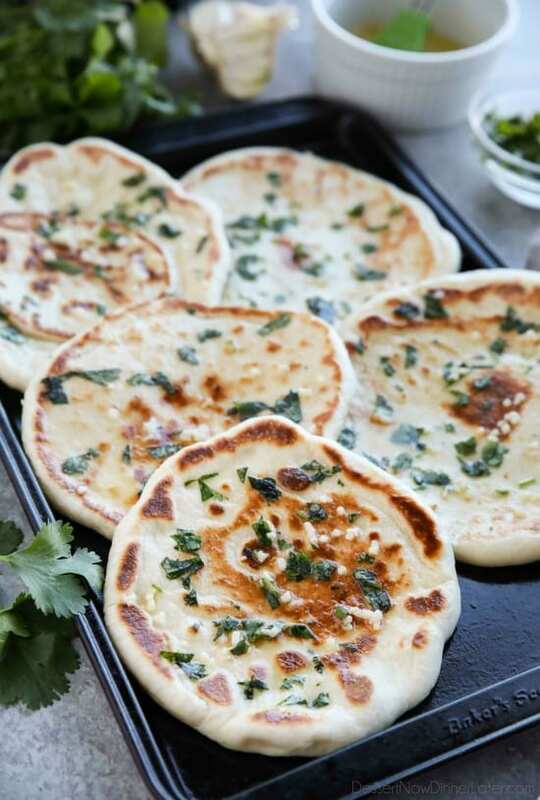 * To REHEAT, toast naan in a skillet for about 30 seconds on each side over medium-high heat.